Go Metro Weekends, ice skating returns to Pershing Square! 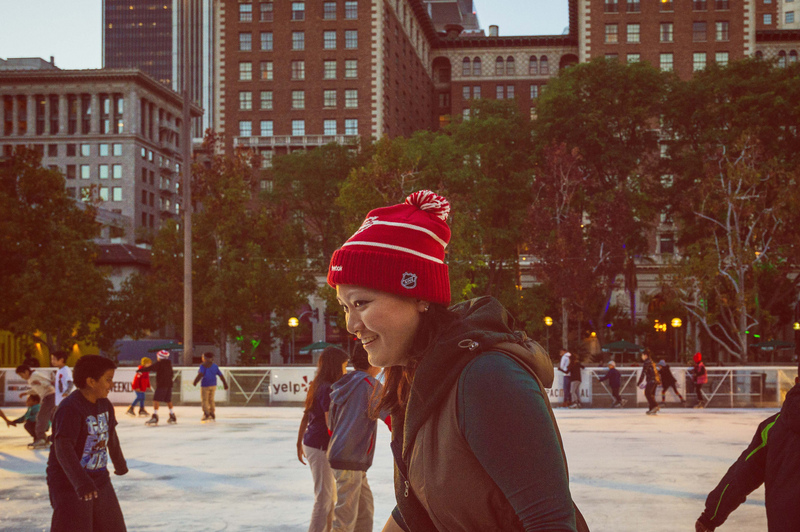 But, back to what you really want and need to know: the Holiday Ice Rink in Pershing Square will be open seven days a week (including holidays) through January 18. Hours vary depending on the day, so be sure to check their website before heading out. The Metro Red and Purple Line can drop you within steps of the rink at Pershing Square Station, or you can take the plethora of Metro buses serving the streets around the square (that’s Olive to the north, Hill to the south, 6th Street to the west and 5th Street to the east). Guests are welcome to purchase tickets at the rink, but as skate time is divided into one-hour sessions, it’s best to buy tickets ahead of time if you don’t like the idea of potentially waiting around for the next time slot. Admission is $9.00 plus an additional $4 for renting skates, if you don’t happen to have your own (Don’t feel bad, this is L.A. after all.) And thanks to our Destination Discounts program, Metro riders save $1 off entrance to the rink simply by showing their valid TAP cards at the admission window.